The café looked like how I’ve always imagined an opium den (not that I’ve spent a lot of time thinking about opium dens). Dimly light, deeply cushioned low-to-the-ground furniture, dark wood and deep reds, subdued voices…as the smoke curls up from each person’s pipe. It’s an odd thing. 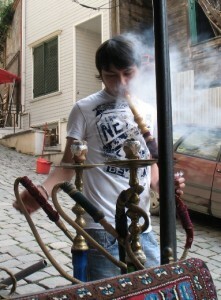 While most of the world advertises the dangers of smoking, in Turkey smoking is a tourist activity. True, the tourists are smoking hookahs, or water pipes, burning herbs or dried fruits rather than opium or even tobacco, not addictive. I suppose it’s a harmless experience. Kathy and I even considered it one damp, rainy night in Istanbul. But it just seemed too absurd when we both despise smoking. And when the cafés specializing in water pipes resembled opium dens. Each café has a water pipe boy whose job is to get the pipe going (using his own mouthpiece). I wonder what qualifications these job ads ask for. “Good lungs, adept with charcoal?” And even if it’s not addictive, all that smoke can’t be good for you. Has anyone ever studied the rates of lung cancer for water pipe boys? And they drink mud. Sweetened mud. They call it coffee. But it comes in small cups, and half the cup is filled with coffee ground mud. I never knew if I was supposed to filter out the grounds with my teeth or just start chewing on them. Or maybe I just needed to accept that what was a small cup of coffee to start with contained only a thimbleful of actual drinkable liquid coffee. I do know you’re supposed to tell your fortune with the coffee grounds. You turn the cup upside down and let it sit while the mud slowly creeps down the sides. Then you look into the cup for shapes that predict your future. While I often see shapes of animals or people or things when I look at clouds, I couldn’t make a thing out of the coffee grounds. Kathy and I finally decided the mound of coffee grounds in the bottom of the cup meant I would soon be taking the funicular to the bottom of the hill to catch the tram. A safe prediction—after we finished our coffee, we were heading to the funicular station. 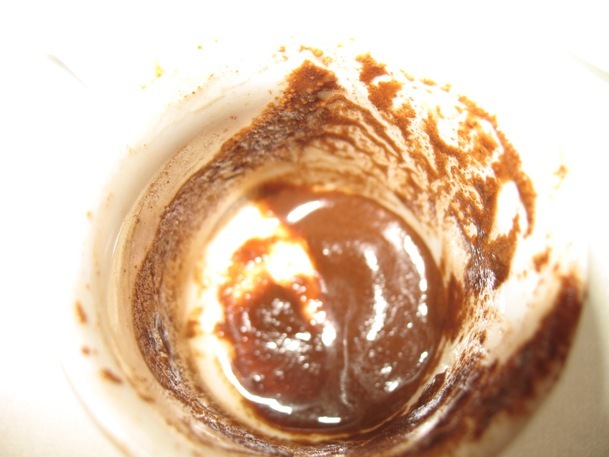 Perhaps as a tourist, I just wasn’t well enough attuned to Turkish mystical forces to read the coffee grounds. Perhaps I should have searched the Spice Bazaar for something to enhance my awareness. There were certainly some intriguing possibilities, like the Snake Oil and Ant Egg Oil. Isn’t Snake Oil supposed to be the panacea to cure any ailment? That seems to be true in Turkey, too. Or maybe it was just because we got conflicting stories on what its purpose was. One Spice Market salesman said Snake Oil was to help grow hair and Ant Egg Oil was to get rid of hair. Another Spice Market salesman told us the exact opposite. Someone else on another day told us Ant Egg Oil would help women get pregnant. Hmm, I’d hate to be trying to change my hair length and end up pregnant. Gotta watch these charming Turkish salesmen. With the same charm they use to sell carpets to unwary travelers, they could easily sell Ant Egg Oil to a pregnant woman!